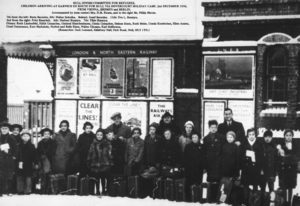 In March it’s been more than 80 years since the first Kindertransport came to Britain. The Kindertransport was a rescue project from Great Britain to save the children from Nazi Germany between 1938 and 1940. They were able to save over 10 000 refugee children. In our collection we have some really special pieces linked to the Kindertransport. One of them is a scroll, made by rescued children at Dovercourt Holiday Camp when it closed. This scroll turned 80 years old at the end of March. 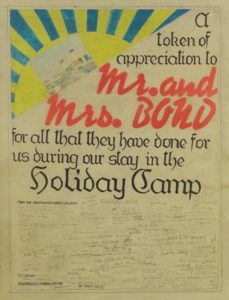 On top of it reads ‘A token of appreciation to Mr and Mrs Bond for all that they have done for us during our stay in the Holiday Camp’. At this point Dovercourt Bay Holiday Camp wasn’t any ordinary holiday camp, it was a safe accommodation for many children from Germany and Austria. They had gathered there, to wait for foster homes be arranged for them. Underneath it has been signed by well over a hundred German refugee children as well as the staff of the camp. The sheet is colourfully decorated with a rising sun and a picture of the camp. The picture above shows refugee children from Vienna, Bremen and Berlin who arrived in Britain in December 1938. Their destination is Hull, via the Dovercourt Bay Camp. This scroll was found in a loft in Chingford. The people who lived there were probably given this scroll by this friend. The granddaughter of Mr and Mrs Bond once said, that they hid the scroll in their loft as they were scared that if the country was invaded by Germany, they would be in trouble for helping these children. The scroll shows how grateful these children were that they had the opportunity to escape from Germany and that they could live a rather peaceful life in Britain. Mr and Mrs Bond seemed to be proud of their gift because they kept it safe so that we are able to show it to the visitors even today. I’ve decided to write about this piece because I think it has a very powerful meaning. I’m convinced that even today one should know what the British people did to save those innocent children and how grateful these children were to get another chance in a foreign country where they didn’t know anyone. Posted in Internships, Learning News by Celina Vogel, ARSP Apprentice on April 17th, 2019.